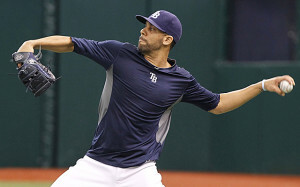 Tampa Bay Rays ace David Price made his first rehab start is going on the DL on May 16 for the High-A Charlotte Stone Crabs. Price worked 2 2/3 innings allowing two earned runs, one earned, and two hits. Price was projected to be out until mid to late June and barring a setback he should make two more rehab starts before returning to Tampa Bay’s rotation Before the All-Star break.